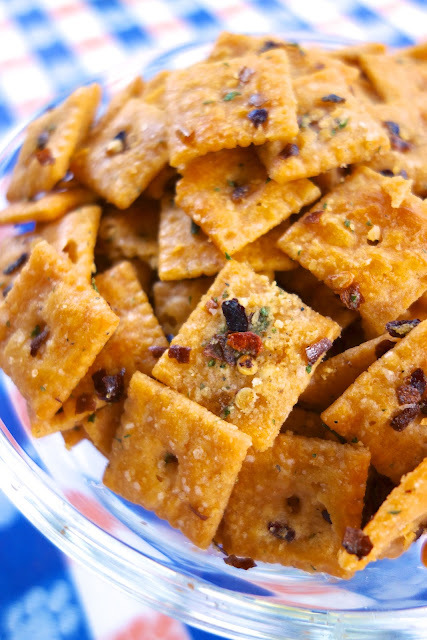 Fire Crackerz - spicy Cheez-Its - coated in red pepper flakes and Ranch dressing - SO addictive! Great for parties! This a variation on my favorite Ranch Oyster Crackers. I swapped out the oyster crackers for Cheez-Its and added some red pepper flakes for a little heat. These were fantastic! I love Cheez-Its, so I know I would love them. This is super easy to make and can be made days in advance. These can pack a lot of heat, so adjust the red pepper accordingly. I used a lot and they were HOT. 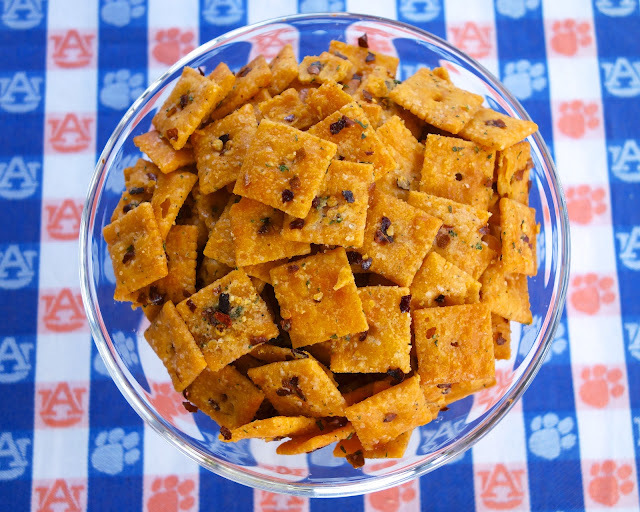 I suggest starting with a tablespoon of red pepper flakes and tasting the crackers. You can add more if you are a spicy heat lover. In a large bowl, mix together all ingredients. Spread crackers on large rimmed baking sheet. Bake for 15-20 minutes, stirring halfway through. Cool and store in resealable bag. What a creative idea and great name!!! As I'm getting older, I find I like my food hotter and hotter. These sound really yummy...and HOT! We all love spicy food--even my kids--so this will be a big hit! These look awesome! I like to make my chex mix in a crock pot - do you think it would work for these also? Can't wait to try them! I've never tried that, but it sounds like it might work. Let us know how it turns out. Great idea and Bev would especially like it - she puts red pepper flakes on most things she eats. Spicy, and good! I'll be making this for Sunday football! Making a batch of these for my brother in law for Christmas, but thinking about using tabasco cheezits! :) Can't wait to make my test batch this weekend! I made them last weekend and they were awesome. Made a double batch but they are gone now. Ha! Sounds like our house. Glad you enjoyed them! Is that tsp or tbsp? You mentioned starting with a tablespoon but recipe uses tsp. They look just fabulous. I made these to take to the school where I teach and you would have thought I slaved for days and made the cheez-its from scratch. People went nuts over these! I am making a triple batch to give with my holiday baking gifts this year. This was truly brilliant. Steph these look incredible! I bet they're so addictive! pinned! Would butter or olive oil work? I use 1/2 cup butter instead of the oil and use Fiesta Ranch mix and 1 tsp. red pepper flakes. It's just the right amount of "zip" for us. Also, I bake the mix for 1 hour at 250, stirring every 15 minutes. It's no longer oily that way and we like it crisper. It is fantastic; you cannot stop at just one handful! How do I get the canola oil taste out of them?